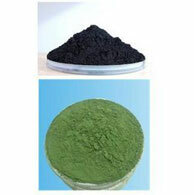 Metallic Salts & Metallic Oxides are used for various industrial applications. The metallic salts and metallic oxides find diverse applications in photo diodes, photo transistors, photo voltaic cells, transparent electrodes, liquid crystal displays, IR detectors, and anti reflection coatings. Nickel oxide can be reacted with acids to form salts and other compounds e.g. nickel sulfamate for electroplating and nickel molybdate for hydrodesulfurisation catalysts. Gold doped nickel oxide films can be used as transparent electrodes in optoelectronic devices. NiCl2 and its hydrate are occasionally useful in organic synthesis. In combination with CrCl2 for the coupling of an aldehyde and a vinylic Iodide to give allylic alcohols. As a precursor to nickel boride, prepared in situ from NiCl2 and NaBH4. This reagent behaves like Raney Nickel, comprising an efficient system for hydrogenation of unsaturated carbonyl compounds. 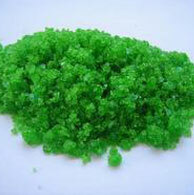 green crystals (hexahydrate) Heavy Metals % by mass 0.05 Max. Odor odorless Nitrates % by mass 0.001 Max. 140 °C (hexahydrate) Insoluble matter % by mass 0.05 Max. 600 g/100 ml (100 °C) Chlorides % by mass 0.01 Max. It is a source of tetrafluoroborate union. It is used in organic chemistry for fluorination reactions and as a catalyst, and for lab-scale preparation of boron trifluoride. 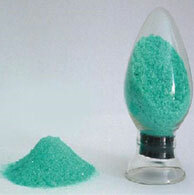 Sodium tetrafluoroborate is used in some fluxes used for brazing. Sodium tetrafluoroborate can be used to prepare nitrosonium tetrafluoroborate, an explosive, by reacting with nitrogen(III) oxide. It can also be used for synthesis of ionic liquids, where the tetrafluoroborate often plays the role of the product's anion. blue crystals (heptahydrate) Nickel (asNi) % by mass 22.0 Min. 1.948 g/cm3 (heptahydrate) Iron (as Fe) % by mass : 0.005 Max. 0.005 Max. 100 °C (hexahydrate, decomp) Insoluble matter % by mass 0.05 Max. 77.5 g/100 ml (30 °C) (heptahydrate) Cobalt (as Co) % by mass 0.5 Max. Acidity (pKa) 4.5 (hexahydrate) Zinc (as Zn) % by mass 0.005 Max.